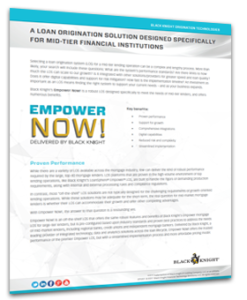 Empower® is Black Knight’s dynamic, innovative, enterprisewide loan origination system (LOS) used by lenders to originate first mortgages and home equity loans and lines of credit. With its automation and robotics capabilities, lenders can enhance data integrity, improve cycle times and lower their origination cost per loan. Empower’s LOS data, pricing and documents can be integrated with your digital platforms through the use of APIs to support your digital mortgage strategy and provide a simpler, faster and more transparent loan process. Black Knight’s Empower Now! is a loan origination system designed specifically to meet the needs of mid-market lenders, including regional banks, credit unions and independent mortgage bankers. Read more about Empower Now here! Black Knight is harnessing the power of artificial intelligence (AI) and machine learning (ML) to help lenders become more efficient and drive down operational costs when originating a loan. AIVASM automates many of the “stare-and-compare,” task-oriented and repetitive manual functions that lenders manage every day. “She” helps accelerate the speed of processing which can result in greater operational efficiency, productivity, reduced costs and a better borrower experience. AIVA is being integrated with Black Knight’s Empower and LendingSpace loan origination systems. In addition, Black Knight’s AI/ML capabilities can be used to enhance efficiency and mitigate risk in other areas of financial services organizations. AIVA is Black Knight’s artificial intelligence virtual assistant. She can read, comprehend and draw conclusions based on context to mimic cogitative thinking and build expertise over time. AIVA is easily scalable and helps deliver operational efficiencies to reduce turn times and origination costs. Black Knight’s Fee Service is designed to help lenders and settlement agents process fees for the Loan Estimate and Closing Disclosure with unparalleled speed and accuracy. This unified access point for all fee-related data provides the flexibility you need to get the information the way you want it – either through the web, XML, mobile and third-party partner integrations. Black Knight’s Fee Service alerts both lenders and settlement agents of fee changes as they happen so the appropriate action can be taken. With this precision, you will save time and costs and help minimize losses during the closing process. LendingSpace® is a scalable web-based loan origination system (LOS) designed specifically for the correspondent lending market. With advanced business rules and workflow, and a component-based design, the LendingSpace LOS streamlines loan processing and data quality checks for the entire loan origination process. To efficiently track and manage mortgage origination sales leads, lenders need an effective and robust solution to assign, prioritize and rapidly respond to new sales opportunities, while nurturing existing relationships to maximize revenue opportunities. Empower Lead Management is an integrated and highly configurable lead and customer relationship management (CRM) solution, designed specifically for lenders to manage new leads, and develop and maintain customer relationships that will ultimately generate new business and boost productivity. Lenders have the option to use either the advanced lead assignment functionality or the business contact management capabilities — or both. Black Knight offers a wide range of technologies designed to integrate seamlessly with lenders’ existing systems. These technologies help to eliminate costly connections and streamline the transfer of information so lenders can capture, share and collaborate more efficiently with their trusted service providers. The foundation of our lending solutions is Exchange℠, currently connecting lenders with more than 25,000 service providers. This secure and integrated technology helps manage the loan origination process, eliminating costly connections to individual service providers, standardizing the user experience, enhancing process efficiency and supporting investor loan-quality requirements. The Black Knight API Gateway offers a self-service API marketplace to help lenders implement their digital strategies. The marketplace facilitates the flow of orders, data and documents between all participants in a real estate transaction in one central location. By registering APIs into the API Gateway, lenders and providers will benefit from using existing assets and capabilities versus creating or buying new ones – saving considerable time and eliminating the need for multiple integrations. Expedite® offers secure electronic-document collaboration and fulfillment services that enable enterprises to accelerate business processes, simplify workflows, adapt to changing industry demands and leverage opportunities quickly and cost-effectively. Indexes and sorts post-closing loan documents based on lender or investor requirements. Organizes records based on the lender’s pre-established rules, prioritizing the most critical first. A digital closing solution, enabling seamless and secure online collaboration between all of the parties involved in a real estate transaction, including the settlement agent, lender, real estate professional, investor and borrower. Expedite Close delivers enhanced process efficiencies, improved borrower satisfaction, lower transaction costs and much more. To learn more click here. A robust online system that enables lenders, settlement agents and title underwriters to better collaborate throughout the loan closing process. Expedite Closing Network offers a settlement agent management tool that acts as a security checkpoint, requiring agents to register before accessing loan documents. Black Knight’s Expedite® Close is an innovative, end-to-end eClosing solution that uses advanced technology and intelligence to systematically select the best way to close each loan. This complete workflow management platform encompasses e-signature, e-document delivery, fulfillment and audit capabilities. With Expedite Close, all participants can seamlessly collaborate, without changing the way they do business today. Supports wet sign, hybrid, hybrid plus eNote, and a full digital close. Our Enterprise Business Intelligence (EBI) platform helps make your loan origination data easier to access, understand and act upon. Our solutions enable you to get the right information to the right people at the right time – and in the right way – so you become more efficient, productive and compliant across your entire organization. A robust business intelligence solution that provides instant access to information from multiple data sources to help forecast and monitor performance. This comprehensive technology offers real-time analytics, enabling lenders to proactively manage operations through key performance indicators, scorecards, executive and employee dashboards, and on-demand interactive reporting. With LoanSphere® Motivity Anywhere℠ … you can access performance information on your mobile device. Our LoanSphere® Data HubSM links your mortgage loan data with third-party data and Black Knight’s vast data assets, which include industry and MLS information, public records and property valuations. The information is matched across data sets to provide the richest source of connected client, property and mortgage data available. Our leading commercial and residential property data is among the most current and accurate available. This robust data helps lenders make critical decisions, identify risk and improve business performance. Black Knight offers intelligent, accurate analytics and predictive modeling via our highly regarded quantitative methods. Our proven, industry-leading models – based on borrower behavioral patterns, projected market trends, and national servicing data dating back to the early 1990s – help lenders make more informed decisions. Black Knight’s Rapid Analytics Platform (RAP) is a innovative virtual analytics lab that allows you to have a workspace that you can execute queries, run models and create advanced analytics for data-driven strategies. There are endless growth opportunities that RAP can provide to improve performance, increase efficiencies and help your company grow. Leveraging our unsurpassed property and mortgage performance databases, as well as scientific-based machine learning techniques, our highly experienced data science team can create predictive analytics for virtually any aspect of your mortgage business. Leveraging the most advanced technology, vast data assets and cutting-edge analytics, we deliver objective, actionable insights into the mortgage and housing markets. Based on our comprehensive data assets, and more than 20 years of modeling and analytics expertise, the Index Suite delivers unmatched depth, coverage and currency. Updated continually, the Index Suite is comprised of two series: a Mortgage Market Index and a Housing Market Index. The Housing Market Index includes previously unavailable insights into the supply side of the housing market. Our experienced consultants can deliver customized solutions. Relying on our unparalleled data, powerful analytics and deep industry experience, Black Knight’s Advisory Services consultants work closely with you to help achieve your business goals.